Attractive, Accessible & Affordable ~ My client has a nice sized corner window, so I’m going to suggest these great cases from West Elm. These are assemble-yourself units, so the rolling casters can be omitted if desired, and the smaller unit will fit perfectly under the windows. We’ll add attractive square baskets in the openings, and because these are tucked in the corner, we can arrange other furnishings to obscure them a bit from open view. Using baskets in open shelving makes it very easy for her son to access his toys, but also very easy for him to put them away! Just Make it Go Away! 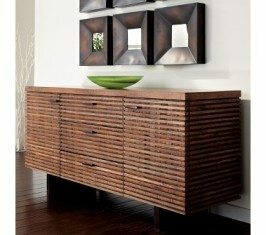 ~ If you’re not big on the idea of open shelving, try using a sideboard for storage, such as this one from Crate & Barrel. My client’s decorating theme is an Asian/Hawaiian/Zen feeling, so this sideboard would fit beautifully. 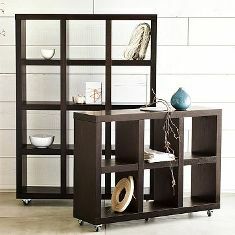 Its combination of shelving and drawers makes it very useful for toy storage, yet easy access for her son. Baskets can still be used on the interior shelves, making clean-up time a snap! I hope you found these storage tips helpful! If you’re finding yourself a bit stuck with how to clear the clutter in your house, my Designer Download™ session can help! It’s one session, with lots of answers, at one affordable price.